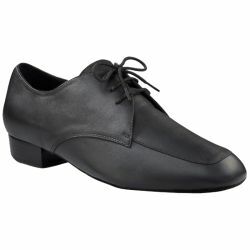 Classic men's ball room dance shoe. Calf skin leather upper, 1" heel, cushioned insole and heel, suede sole. Begin fitting with street shoe size. Available in black size 7M – 14M.